Osteitis fibrosa cystica (/ˌɒstiˈaɪtɪs faɪˈbroʊsə ˈsɪstɪkə/ OS-tee-AY-tis fy-BROH-sə SIS-tik-ə), is a skeletal disorder resulting in a loss of bone mass, a weakening of the bones as their calcified supporting structures are replaced with fibrous tissue (peritrabecular fibrosis), and the formation of cyst-like brown tumors in and around the bone. Osteitis fibrosis cystica, abbreviated OFC, also known as osteitis fibrosa, osteodystrophia fibrosa, and von Recklinghausen's disease of bone (not to be confused with von Recklinghausen's disease, neurofibromatosis type I), is caused by hyperparathyroidism, which is a surplus of parathyroid hormone from over-active parathyroid glands. This surplus stimulates the activity of osteoclasts, cells that break down bone, in a process known as osteoclastic bone resorption. The hyperparathyroidism can be triggered by a parathyroid adenoma, hereditary factors, parathyroid carcinoma, or renal osteodystrophy. Osteoclastic bone resorption releases minerals, including calcium, from the bone into the bloodstream, causing both elevated blood calcium levels, and the structural changes which weaken the bone. The symptoms of the disease are the consequences of both the general softening of the bones and the excess calcium in the blood, and include bone fractures, kidney stones, nausea, moth-eaten appearance in the bones, appetite loss, and weight loss. First described in the nineteenth century, OFC is currently detected through a combination of blood testing, X-rays, and tissue sampling. Before 1950, around half of those diagnosed with hyperparathyroidism in the United States saw it progress to OFC, but with early identification techniques and improved treatment methods, instances of OFC in developed countries are increasingly rare. Where treatment is required, it normally involves addressing the underlying hyperparathyroidism before commencing long-term treatment for OFC—depending on its cause and severity, this can range from hydration and exercise to surgical intervention. Osteitis fibrosa cystica is defined as the classic skeletal manifestation of advanced hyperparathyroidism. Under the ICD-10 classification system, established by the World Health Organization, OFC is listed under category E21.0, primary hyperparathyroidism. The major symptoms of OFC are bone pain or tenderness, bone fractures, and skeletal deformities such as bowing of the bones. The underlying hyperparathyroidism may cause kidney stones, nausea, constipation, fatigue and weakness. X-rays may indicate thin bones, fractures, bowing, and cysts. Fractures are most commonly localized in the arms, legs, or spine. The addition of weight loss, appetite loss, vomiting, polyuria, and polydipsia to the aforementioned symptoms may indicate that OFC is the result of parathyroid carcinoma. Parathyroid carcinoma, an uncommon cancer of the parathyroid glands, is generally indicated by serum calcium levels higher than usual, even in comparison to the high serum calcium levels that OFC generally presents with. Symptoms are also often more severe. Generally, the presence of a palpable neck mass is also indicative of the cancer, occurring in approximately 50% of sufferers, but virtually nonexistent in individuals with OFC with a different origin. The vast majority of cases of hyperparathyroidism are the result of the random formation of benign, but metabolically active, parathyroid adenoma swellings. These instances comprise approximately 80–85% of all documented cases of hyperparathyroidism. Approximately 1 in 10 documented cases of hyperparathyroidism are a result of hereditary factors. Disorders such as familial hyperparathyroidism, multiple endocrine neoplasia type 1 (MEN Type 1) and hyperparathyroidism-jaw tumor syndrome can, if left unchecked, result in OFC. MEN Type 1 is an autosomal dominant disorder and the most common hereditary form of hyperparathyroidism, affecting about 95% of genetic cases of OFC, and also tends to affect younger patients than other forms. Major mutations which can lead to hyperparathyroidism generally involve the parathyroid hormone receptor, G proteins, or adenylate cyclase. Certain genetic mutations have been linked to a higher rate of parathyroid carcinoma occurrence, specifically mutations to the gene HRPT2, which codes for the protein parafibromin. Parathyroid carcinoma (cancer of the parathyroid gland) is the rarest cause of OFC, accounting for about 0.5% of all cases of hyperparathyroidism. OFC onset by parathyroid carcinoma is difficult to diagnose. OFC is a common presentation of renal osteodystrophy, which is a term used to refer to the skeletal complications of end stage renal disease (ESRD). OFC occurs in approximately 50% of patients with ESRD. ESRD occurs when the kidneys fail to produce calcitriol, a form of Vitamin D, which assists in the absorption of calcium into the bones. When calcitriol levels decrease, parathyroid hormone levels increase, halting the storage of calcium, and instead triggering its removal from the bones. The concept of renal osteodystrophy is currently included into the broader term chronic kidney disease-mineral and bone disorder (CKD-MBD). fanconi syndrome, : decrease aminoacids, phosphate, glucose, bicarbonate and potasum salts. The effects of OFC on bone are largely dependent on the duration of the disease and the level of parathyroid hormone (PTH) produced. PTH is responsible for maintaining a homeostatic calcium concentration in the blood. It activates the parathyroid-hormone related protein receptor located on osteoblasts and osteocytes, both of which are responsible for the building and calcification of bone. Abnormalities affecting the parathyroid glands cause a surplus of PTH, which, in turn, increases the activity and frequency of osteoblasts and osteocytes. Increased PTH levels trigger the release of stored calcium through the dissolution of old bone, as well as the conservation of serum calcium through a cessation in the production of new bone. Generally, the first bones to be affected are the fingers, facial bones, ribs, and pelvis. Long bones, which are longer than they are wide, are also among the first affected. As the disease progresses, any bone may be affected. OFC may be diagnosed using a variety of techniques. Muscles in patients afflicted with OFC can either appear unaffected or "bulked up." If muscular symptoms appear upon the onset of hyperparathyroidism, they are generally sluggish contraction and relaxation of the muscles. Deviation of the trachea (a condition in which the trachea shifts from its position at the midline of the neck), in conjunction with other known symptoms of OFC can point to a diagnosis of parathyroid carcinoma. Blood tests on patients with OFC generally show high levels of calcium (normal levels are considered to range between 8.5 and 10.2 mg/dL, parathyroid hormone (levels generally above 250 pg/mL, as opposed to the "normal" upper-range value of 65 pg/mL), and alkaline phosphatase(normal range is 20 to 140 IU/L). X-rays may also be used to diagnose the disease. Usually, these X-rays will show extremely thin bones, which are often bowed or fractured. However, such symptoms are also associated with other bone diseases, such as osteopenia or osteoporosis. Generally, the first bones to show symptoms via X-ray are the fingers. Furthermore, brown tumors, especially when manifested on facial bones, can be misdiagnosed as cancerous. Radiographs distinctly show bone resorption and X-rays of the skull may depict an image often described as "ground glass" or "salt and pepper". Dental X-rays may also be abnormal. Histology of bone showing osteitis fibrosa cystica. (Fibrosis and intratrabecular tunnels are seen). Cysts may be lined by osteoclasts and sometimes blood pigments, which lend to the notion of "brown tumors." Such cysts can be identified with nuclear imaging combined with specific tracers, such as sestamibi. Identification of muscular degeneration or lack of reflex can occur through clinical testing of deep tendon reflexes, or via photomotogram (an achilles tendon reflex test). Fine needle aspiration (FNA) can be used to biopsy bone lesions, once found on an X-ray or other scan. Such tests can be vital in diagnosis and can also prevent unnecessary treatment and invasive surgery. Conversely, FNA biopsy of tumors of the parathyroid gland is not recommended for diagnosing parathyroid carcinoma and may in fact be harmful, as the needle can puncture the tumor, leading to dissemination and the possible spread of cancerous cells. The brown tumors commonly associated with OFC display many of the same characteristics of osteoclasts. These cells are characteristically benign, feature a dense, granular cytoplasm, and a nucleus that tends to be ovular in shape, enclosing comparatively fine chromatin. Nucleoli also tend to be smaller than average. Medical management of OFC consists of Vitamin D treatment, generally alfacalcidol or calcitriol, delivered intravenously. Studies have shown that in cases of OFC caused by either end-stage renal disease or primary hyperparathyoidism, this method is successful not only in treating underlying hyperparathyoidism, but also in causing the regression of brown tumors and other symptoms of OFC. In especially severe cases of OFC, parathyroidectomy, or the full removal of the parathyroid glands, is the chosen route of treatment. Parathyroidectomy has been shown to result in the reversal of bone resorption and the complete regression of brown tumors. In situations where parathyroid carcinoma is present, surgery to remove the tumors has also led to the regression of hyperparathyroidism as well as the symptoms of OFC. Bone transplants have proven successful in filling the lesions caused by OFC. A report showed that in 8 out of 11 instances where cavities caused by OFC were filled with transplanted bone, the lesion healed and the transplanted bone blended rapidly and seamlessly with the original bone. Almost all who undergo parathyroidectomy experience increased bone density and repair of the skeleton within weeks. Additionally, patients with OFC who have undergone parathyroidectomy begin to show regression of brown tumors within six months. Following parathyroidectomy, hypocalcaemia is common. This results from a combination of suppressed parathyroid glands due to prolonged hypercalcaemia, as well as the need for calcium and phosphate in the mineralization of new bone. Thirty percent of patients with OFC-like tumors caused by metastatic parathyroid carcinoma who undergo surgery see a local recurrence of symptoms. The post-surgical survival rate hovers around seven years, while patients who do not undergo surgery have a survival rate of around five years. Osteitis fibrosa cystica has long been a rare disease. Today, it appears in only 2% of individuals diagnosed with primary hyperparathyroidism, which accounts for 90% of instances of the disease. Primary hyperparathyroidism is three times as common in individuals with diabetes mellitus. The hospitalization rate for hyperparathyroidism in the United States in 1999 was 8.0 out of 100,000. The disease has a definite tendency to affect younger individuals, typically appearing before the age of 40, with a study in 1922 reporting that 70% of cases display symptoms before the age of 20, and 85% before 35. Primary hyperparathyoidism, as well as OFC, is more common in Asiatic countries. Before treatment for hyperparathyroidism improved in the 1950s, half of those diagnosed with hyperparathyroidism saw it progress into OFC. Rates of OFC increase alongside cases of unchecked primary hyperparathyroidism. In developing countries, such as India, rates of disease as well as case reports often mirror those published in past decades in the developed world. The other 10% of cases are primarily caused by primary hyperplasia, or an increase of the number of cells. Parathyroid carcinoma accounts for less than 1% of all cases, occurring most frequently in individuals around 50 years of age (in stark contrast to OFC as a result of primary hyperparathyroidism) and showing no gender preference. Approximately 95% of hyperparatyhroidism caused by genetic factors is attributed to MEN type 1. This mutation also tends to affect younger individuals. The condition was first described by Gerhard Engel in 1864 and Friedrich Daniel von Recklinghausen in 1890, though William Hunter, who died in 1783, is credited with finding the first example of the disease. "von Recklinghausen's disease" (without the qualification "of bone") is a completely unrelated disorder, nowadays termed neurofibromatosis. In 1884, Davies Colley delivered a presentation to the Pathological Society of London that detailed the manifestation of hyperparathyroidism into a brown tumor of the mandible, as well as the histological makeup of the tumor. The discovery and subsequent description of the parathyroid glands is credited to Ivar Sandstrom, though his publication, On a New Gland in Man and Several Mammals-Glandulae Parathyroideae, received little attention. Gustaf Retzius and Eugene Gley compounded his research, the latter credited with the discovery of the function of the parathyroid glands. This research cumulated in the first surgical removal of a parathyroid tumor by Felix Mandel in 1925. A 2.5 × 1.5-inch (64 × 38 mm) tumor was removed from the thyroid artery of a man suffering from advanced OFC. The patient's symptoms disappeared, only to return in approximately six years as a result of renal stones that were diagnosed only after the patient had died. In 1932, blood tests on a female patient suffering from renal stone-based OFC revealed extremely high blood calcium levels. Fuller Albright diagnosed and treated the woman, who suffered from a large tumor of the neck as well as renal stones. The first published literature to describe a brown tumor (which was linked to OFC) was published in 1953, though clinical reports from before 1953 do draw a correlation between the disease and tumors previous to the publication. The advent of the multichannel autoanalyzer in the 1960s and 70s led to an increase in early diagnosis of primary hyperparathyroidism. This increase led to a sharp decline in the prolonged manifestation of the disease, leading to a drop in the number of cases of OFC due to the early detection of hyperparathyroidism. Before this invention, the diagnosis of primary hyperparathyroidism was generally prolonged until the emergence of severe manifestations, such as OFC. ^ "Chapter 4: Endocrine, nutritional, and metabolic diseases". World Health Organization. WHO. 2006-12-11. Archived from the original on 2009-04-22. Retrieved 2009-03-21. ^ a b c d "Osteitis fibrosa". MedlinePlus. U.S. National Library of Medicine. 2008-09-25. Archived from the original on 2008-10-01. Retrieved 2008-10-04. ^ a b Rubin, M. R. (2001). "Tc99m-Sestamibi Uptake in Osteitis Fibrosa Cystica Simulating Metastatic Bone Disease". Journal of Clinical Endocrinology & Metabolism. 86 (11): 5138–41. doi:10.1210/jc.86.11.5138. ^ Hundahl, SA; Fleming, ID; Fremgen, AM; Menck, HR (Aug 1, 1999). "Two hundred eighty-six cases of parathyroid carcinoma treated in the U.S. between 1985-1995: a National Cancer Data Base Report. The American College of Surgeons Commission on Cancer and the American Cancer Society". Cancer. 86 (3): 538–44. doi:10.1002/(SICI)1097-0142(19990801)86:3<538::AID-CNCR25>3.0.CO;2-K. PMID 10430265. ^ McCance, DR; Kenny, BD; Sloan, JM; Russell, CF; Hadden, DR (1987). "Parathyroid carcinoma: A review". Journal of the Royal Society of Medicine. 80 (8): 505–9. doi:10.1177/014107688708000816. PMC 1290959. PMID 3309302. ^ Quade, Gustav (2008-01-03). 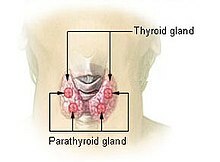 "Parathyroid Cancer Treatment". German National Cancer Institute. Archived from the original on 2009-02-02. Retrieved 2008-12-10. ^ a b c d Kearns, A. E.; Thompson, G. B. (2002). "Medical and Surgical Management of Hyperparathyroidism". Mayo Clinic Proceedings. 77 (1): 87–91. doi:10.4065/77.1.87. PMID 11794462. ^ Eubanks, P. J.; Stabile, BE (1998). "Osteitis Fibrosa Cystica with Renal Parathyroid Hormone Resistance: A Review of Pseudohypoparathyroidism with Insight into Calcium Homeostasis". Archives of Surgery. 133 (6): 673–6. doi:10.1001/archsurg.133.6.673. PMID 9637471. ^ Guru, S. C. (1998). "Menin, the product of the MEN1 gene, is a nuclear protein". Proceedings of the National Academy of Sciences. 95 (4): 1630–4. doi:10.1073/pnas.95.4.1630. PMC 19125. PMID 9465067. ^ Lawrence, Kim (2006-06-05). "Parathyroid Carcinoma". EMedicine. Archived from the original on 2008-12-08. Retrieved 2009-01-07. ^ Mourelatos, Zissimos; Herbert Goldberg; Grant Sinson; Dianna Quan; Ehud Lavi (2005-07-03). "Final Diagnosis – Brown Tumor (Giant Cell Tumor of Hyperparathyroidism)". University of Pittsburgh School of Medicine. Retrieved 2008-11-17. ^ Delmez, James (January 2005). "Renal Osteodystrophy" (PDF). National Institute of Health. U.S. Department of Health and Human Services. Archived (PDF) from the original on 2009-05-07. Retrieved 2009-04-06. ^ Moe S, Drüeke T, Cunningham J, Goodman W, Martin K, Olgaard K, Ott S, Sprague S, Lameire N, Eknoyan G (2006). "Definition, evaluation, and classification of renal osteodystrophy: a position statement from Kidney Disease: Improving Global Outcomes (KDIGO)". Kidney International. 69 (11): 1945–1953. doi:10.1038/sj.ki.5000414. PMID 16641930. ^ Cordy, PE; Gagnon R; Taves DR; Kaye M (1974-07-22). "Bone disease in hemodialysis patients with particular reference to the effect of fluoride". Canadian Medical Association Journal. 110 (12): 1349–1353. PMC 1947652. PMID 4834525. ^ Johnson, William J; Donald Taves (1974). "Exposure to excessive fluoride during hemodialysis". Kidney International, Vol 5. Retrieved 2019-01-21. ^ "B Fluoride in Drinking Water: A Scientific Review of EPA's Standards". Canadian Medical Association Journal. 2006. doi:10.17226/11571. Retrieved 2019-01-22. ^ a b c Watson, Carolyn W.; Unger, Pamela; Kaneko, Mamoru; Gabrilove, Jacques L. (1985). "Fine needle aspiration of osteitis fibrosa cystica". Diagnostic Cytopathology. 1 (2): 157–60. doi:10.1002/dc.2840010212. PMID 3836078. ^ Wesseling, Katherine; Bakkaloglu, Sevcan; Salusky, Isidro (2007). "Chronic kidney disease mineral and bone disorder in children". Pediatric Nephrology. 23 (2): 195–207. doi:10.1007/s00467-007-0671-3. PMC 2668632. PMID 18046581. ^ a b c Salerno, G.; Gilbert, J.; Sharif, H. (2002). "Bilateral knee pain with hyperparathyroidism". Journal of the Royal Society of Medicine. 95 (3): 134–6. doi:10.1258/jrsm.95.3.134. PMC 1279482. PMID 11872764. ^ a b c d e f g h Gupta, Anju; Horattas, Mark C.; Moattari, Ali Reza; Shorten, Scott D. (October 2001). "Disseminated Brown Tumors from Hyperparathyroidism Masquerading as Metastatic Cancer: A Complication of Parathyroid Carcinoma". The American Surgeon. 67 (10): 951–5. PMID 11603552. Retrieved 2009-02-26. ^ "Serum calcium". MedlinePlus. U.S. National Library of Medicine. 2007-10-30. Archived from the original on 2009-09-24. Retrieved 2009-10-27. ^ Aloia, JF; Feuerman, M; Yeh, JK (2006). "Reference range for serum parathyroid hormone". Endocrine Practice. 12 (2): 137–44. doi:10.4158/ep.12.2.137. PMC 1482827. PMID 16690460. ^ "ALP isoenzyme test". MedlinePlus. U.S. National Library of Medicine. 2009-05-07. Archived from the original on 2009-10-20. Retrieved 2009-10-26. ^ a b Reséndiz-Colosia, Jaime Alonso; Rodríguez-Cuevas, Sergio Arturo; Flores-Díaz, Rutilio; Juan, Martín Hernández-San; Gallegos-Hernández, José Francisco; Barroso-Bravo, Sinhué; Gómez-Acosta, Fernando (2008). "Evolution of maxillofacial brown tumors after parathyroidectomy in primary hyperparathyroidism". Head & Neck. 30 (11): 1497–504. doi:10.1002/hed.20905. PMID 18704965. ^ "Association of Level Oo GFR with Bone Disease And Disorders of Calcium And Phosphorus Metabolism". NKF K/DOQI Guidelines. National Kidney Foundation. 2002. Archived from the original on 2008-10-13. Retrieved 2008-11-17. ^ Hurd, Robert (2006-08-11). "Osteitis fibrosa". UCLA Health. UCLA. Archived from the original on 2011-07-19. Retrieved 2008-10-22. ^ "Photomotogram (achilles reflex test)". The Western Journal of Medicine. 127 (2): 177. 1977. PMC 1237752. PMID 18748025. ^ Kemp, Anna M. Collins; Bukvic, Meliha; Sturgis, Charles D. (2008). "Fine Needle Aspiration Diagnosis of Osteitis Fibrosa Cystica (Brown Tumor of Bone)". Acta Cytologica. 52 (4): 471–4. doi:10.1159/000325556. PMID 18702368. ^ Kim, Lawrence (2006-06-05). "Parathyroid Carcinoma: Differential Diagnoses & Workup". eMedicine. Archived from the original on 2009-05-27. Retrieved 2009-01-28. ^ a b Arabi, A. (2006). "Regression of Skeletal Manifestations of Hyperparathyroidism with Oral Vitamin D". Journal of Clinical Endocrinology & Metabolism. 91 (7): 2480–3. doi:10.1210/jc.2005-2518. PMID 16608887. ^ Ellis, H. A.; Floyd, M.; Herbert, F. K. (1971). "Recurrent hyperparathyroidism due to parathyroid carcinoma". Journal of Clinical Pathology. 24 (7): 596–604. doi:10.1136/jcp.24.7.596. PMC 477103. PMID 4107487. ^ Brand, Richard A. (2008). "Follow-Up Study of the Use of Refrigerated Homogenous Bone Transplants in Orthopaedic Operations". Clinical Orthopaedics and Related Research. 466 (1): 22–36. doi:10.1007/s11999-007-0030-5. PMC 2505281. PMID 18196370. ^ Silverberg, Shonni J.; Shane, Elizabeth; Jacobs, Thomas P.; Siris, Ethel; Bilezikian, John P. (1999). "A 10-Year Prospective Study of Primary Hyperparathyroidism with or without Parathyroid Surgery". New England Journal of Medicine. 341 (17): 1249–55. doi:10.1056/NEJM199910213411701. PMID 10528034. ^ Agarwal, Gaurav; Mishra, Saroj K; Kar, Dilip K; Singh, Anil K; Arya, Vivek; Gupta, Sushil K; Mithal, Ambrish (2002). "Recovery pattern of patients with osteitis fibrosa cystica in primary hyperparathyroidism after successful parathyroidectomy". Surgery. 132 (6): 1075–85. doi:10.1067/msy.2002.128484. PMID 12490858. ^ Gibbs, C. J.; Millar, J. G.; Smith, J. (1996). "Spontaneous healing of osteitis fibrosa cystica in primary hyperparathyroidism". Postgraduate Medical Journal. 72 (854): 754–7. doi:10.1136/pgmj.72.854.754. PMC 2398661. PMID 9015472. ^ Coley, Bradley L.; Higibotham, Norman L. (1934). "Solitary Bone Cyst". Annals of Surgery. 99 (3): 432–48. doi:10.1097/00000658-193403000-00003. PMC 1390041. PMID 17867151. ^ Gulcelik, Nese Ersoz; Bozkurt, Fani; Tezel, Gaye Güler; Kaynaroglu, Volkan; Erbas, Tomris (2008). "Normal parathyroid hormone levels in a diabetic patient with parathyroid adenoma". Endocrine. 35 (2): 147–50. doi:10.1007/s12020-008-9135-1. PMID 19116787. ^ Melton Lj, 3rd (2002). "The epidemiology of primary hyperparathyroidism in North America". Journal of Bone and Mineral Research. 17 Suppl 2: N12–7. PMID 12412772. ^ Mishra, S. K.; Agarwal, G.; Kar, D. K.; Gupta, S. K.; Mithal, A.; Rastad, J. (2001). "Unique clinical characteristics of primary hyperparathyroidism in India". British Journal of Surgery. 88 (5): 708–14. doi:10.1046/j.0007-1323.2001.01775.x. PMID 11350446. ^ Agarwal, Gaurav; Mishra, Saroj K; Kar, Dilip K; Singh, Anil K; Arya, Vivek; Gupta, Sushil K; Mithal, Ambrish (2002). "Recovery pattern of patients with osteitis fibrosa cystica in primary hyperparathyroidism after successful parathyroidectomy". Surgery. 132 (6): 1075–83, discussion 1083–5. doi:10.1067/msy.2002.128484. PMID 12490858. ^ Buchanan, W. W. (2003). "William Hunter (1718-1783)". Rheumatology. 42 (10): 1260–1261. doi:10.1093/rheumatology/keg003. PMID 14508042. ^ Buchanan, WW; Kraag, GR; Palmer, DG; Cockshott, WP (1981). "The first recorded case of osteitis fibrosa cystica". Canadian Medical Association Journal. 124 (6): 812–5. PMC 1705307. PMID 7471024. ^ a b Rowlands, BC (1972). "Hyperparathyroidism: An early historical survey". Annals of the Royal College of Surgeons of England. 51 (2): 81–90. PMC 2388184. PMID 5077791. ^ Campuzano-Zuluaga, Germán; Velasco-Pérez, William; Marín-Zuluaga, Juan Ignacio (2009). "A 60-year-old man with chronic renal failure and a costal mass: A case report and review of the literature". Journal of Medical Case Reports. 3: 7285. doi:10.4076/1752-1947-3-7285. PMC 2737768. PMID 19830164. Campbell, Neil (1987). Biology. Menlo Park, Calif: Benjamin/Cummings Pub. Co. ISBN 978-0-8053-1840-1. Eberstein, Arthur; Goodgold, Joseph (1983). Electrodiagnosis of Neuromuscular Diseases. Baltimore: Williams & Wilkins. ISBN 978-0-683-03686-2. Ellis, Harold (2002). A History of Surgery. London: Greenwich Medical Media. p. 210. ISBN 978-1-84110-181-1. Hricik, Donald; R. Tyler Miller; John R. Sedor (2003). Nephrology Secrets. Hanley & Belfus. p. 175. ISBN 978-1-56053-502-7. Levine, Michael W.; Bilezikian, John P.; Marcus, Robert (2001). The Parathyroids: Basic and Clinical Concepts. Boston: Academic Press. ISBN 978-0-12-098651-4. Stevens, Arthur (1922). "The Practice of Medicine". W. B. Saunders Co.
Patton, Kevin T.; Thibodeau, Gary A. (1996). Anthony's Textbook of Anatomy & Physiology. St. Louis: Mosby. ISBN 978-0-8151-8861-2.